Photo 1. Lines indicate that when the stirrup swings forward the heel may look lower than the toe but in this is because the stirrup has risen on the arc of the circle making the heel appear lower when it has not changed in relation to the stirrup. Do your feet go numb when you ride? Do you brace against your stirrups? Do your knees hurt? 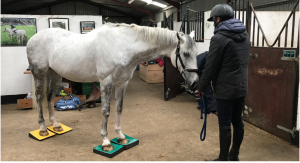 Weighting your stirrup without applying additional pressure can solve these problems. Next time you ride notice how hard you press your foot against the stirrup. Do you force your heel down? Is your stirrup angled ahead of a vertical line from the stirrup bar? Drop your stirrup observing if it moves back when your foot is out. If so you are pushing it forward. 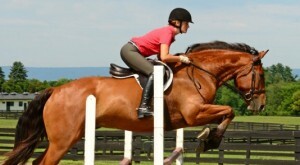 You can also look at a photograph to determine is you are putting too much pressure on your stirrups. Another way to check is use a photograph. Draw a line from the stirrup bar to the stirrup. It should be vertical. If not you are either pushing your foot forward or pulling your foot back depending on which way the line angles. Also look at your knee angle. Is it open or closed? 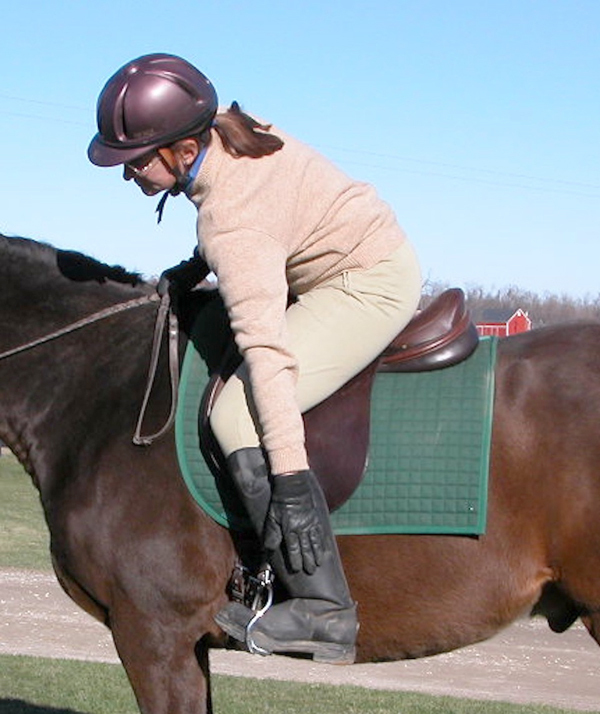 An open angle often goes along with a stirrup that is pushed forward. Using pressure to get your heel down often causes your ankle and knee to stiffen. As you push down the stirrup pushes back against you, sending you out of the saddle instead of sitting deep. To have your head over your feet you will have to lean forward. This puts more weight on the horse’s forehand instead of staying over his center of balance. When the stirrup swings forward it may give the appearance that your heel is down but relative to the stirrup it hasn’t changed. The illusion that your heel is down is caused by the pendulum swing. As the stirrup moves forward it rises along the arc of a circle. Your heel may look lower than your toes but that is because your stirrup is higher on the arc. Relative to the stirrup your heel is no deeper and you have straightened your knee. The downward pressure you exert on the stirrup can cause and the upward pressure the stirrup exerts back on you collides at the unbending knee causing pain. Photo 2. The rider slides her hand down the side of her leg by folding at the hips and keeping her seat on the saddle. When your foot rests on the stirrup without excessive pressure your weight is distributed across your seat and thighs, not just on the stirrups. This allows your calf muscles to soften and lengthen so that your ankle can close sinking your heel down. You can check if you have your weight correctly distributed by picking up your foot with your hand. If you are bracing against your stirrup it will be impossible for you to lift your foot! To lift your foot you must redistribute your weight, soften your hip, knee and ankle. Once you can do this you will feel the difference between the weight of your foot on the stirrup and pressure against it. Start by sliding one hand down your thigh. You can go from the front, the side and the back of the leg. Shorten your stirrups if you like but make sure you move your seat back. If you are too far forward you may feel like you are going to fall off! Keep your seat in the saddle. Slide down and up a few times until this becomes comfortable and familiar. Then see if you can reach your foot. If you press on the stirrup and it will swing forward and you push yourself out of the saddle. This will make it very difficult to reach your foot never mind pick it up! Use your hand to pick up your foot. You only want to raise it ½ inch. If you can’t lift your foot at first come up and slide down and again. It may take a few times before you figure out how to stop pushing against the stirrup and where to rest your weight. Are your hips far enough back in the saddle? Do you allow your knee to bend? Use your hand to lift so that your leg is passive. 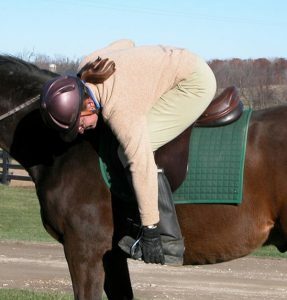 Remember your horse should be able to move your leg! Repeat on the other side. If you want a challenge see if you can pick your foot up at the walk and trot. Photo 3. 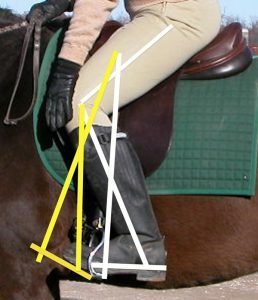 With her hand under the arch of her foot she can lift it slightly by allowing her hip and knee to flex while keeping her weight back and centered over the saddle. Use this Murdoch Minute to check that you are not bracing against your stirrups. When you can pick up your foot with your hand you will allow your horse to move your leg so that you follow his motion. You may be surprised that your feet don’t go numb and your knees stop hurting when your hip, knee and ankle follow your horse’s motion and always remember to enjoy the ride! Wendy Murdoch is available for lessons and clinics in the Northern Virginia region as well as throughout the United States. 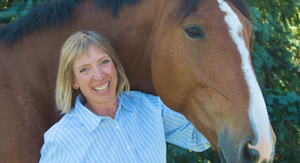 She teaches riders of all levels and disciplines how to improve the horse’s performance by improving their body position. On-line find more articles, blog and her book 50 5-Minute Fixes to Improve Your Riding, based on the Murdoch Minutes at www: murdochmethod.com.